High Quality Content by WIKIPEDIA articles! 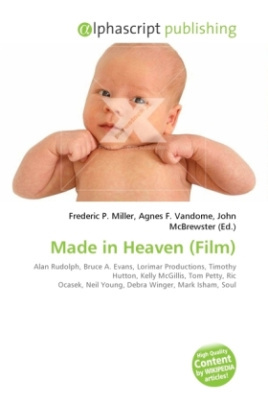 Made in Heaven is a 1987 feature film directed by Alan Rudolph, script from Bruce A. Evans and Raynold Gideon, and produced by Lorimar Productions. The film stars Timothy Hutton and Kelly McGillis and has cameos by Tom Petty, Ric Ocasek, and Neil Young. An additional character known only as "Emmett" in the film was played by Debra Winger, who acted as a chain-smoking male angel. The original music score was composed by Mark Isham. The film was marketed with the tagline "How in Heaven did they meet? How on Earth will they find each other?". Made in Heaven concerns two souls who cross paths in Heaven and then attempt to reconnect once they are reborn on Earth. In 2009 the movie made its dvd debut as part of the Warner Archive Collection.